Living close to a famous place, you have the opportunity to see it during various seasons and weather circumstances, different times of the day, with and without the crowds. I don't live near the pyramids or Niagara Falls, but at bicycle distance from Kinderdijk, the Unesco world heritage site with nineteen windmills. As a result I have, by now, an interesting collection of photographs of the location. 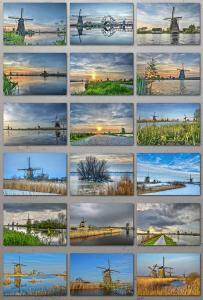 A selection of those can be viewed at the Windmills galery of my page. Take a look! It looked like we picked the wrong day for a photo expedition to Amsterdam. Strong winds and persistent rain made photography impossible. But in the evening our fortunes changed: the dark clouds finally retreated. 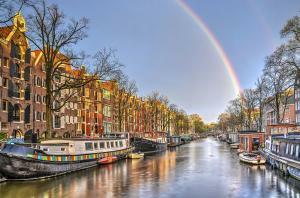 This image shows the rainbowas seen from a bridge across Brouwersgracht, with some final raindrops falling into the canal. Schiedam is, in fact, the city where I was born, although I've only lived there the first three days of my life. Yesterday I was there around sunset, when the conditions were just right for some beautiful pictures. Like this one, showing the Short Harbour (yes, there's also a Long Harbour) with a historic vessel moored next to the former Corn Exchange, which is now a public library. Fort Bourtange, located in the province of Groningen in the northeast of the Netherlands, represents an amazing achievement in reconstruction work. The fortifications, shaped like a pentagon, reached their maximum expansion in 1742, but were dismantled in the nineteenth century. In the 1960's the municipality decided to reconstruct the Fort, to stimulate tourism. It took several decades to complete the work but walking around there now, it's like the ramparts, moats, the houses and the pentagonal central space have never been away. - there's no need to get up really early or wait till late in the evening to capture a sunset or sunrise, or to enjoy the benfits of the Golden and Blue Hours. - after the comfortably warm but slightly boring summer the landscape suddenly gets a magnitude more spectacular, with a shades of green, yellow, red and brown. A couple of photo expeditions in the last few weeks have resulted is some great autumn images which are now finding their way to my Fine Art America profile. You're welcome to take a look! 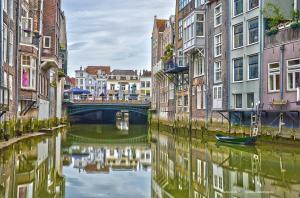 I've been to Leiden several times over the last few months, for various reasons. Of course I always take my camera, because the old center is packed with scenic urban beauty. The most spectacular spot in town is the Burcht, a circular tower built on a steep artificial hill in the heart of the old city, where two arms of the old Rhine river come together. 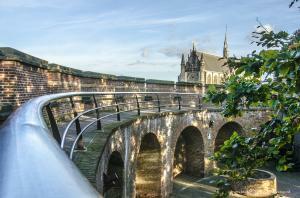 A high viewpoint, for Dutch standards which offers great views of the medieval network of streets, alleys and canals around it. It was a beautiful day in late summer, or early autumn. I hiked 14 kilometres from Breukelen/Brooklyn to visit a friend who is living right in the middle of the Loosdrecht Lakes area. In a way this is the Central Park of the ring of cities in the western part of the country. Amsterdam and Utrecht are just 20 minutes away but here there's peace and quiet. Well, and a lot of watersports. 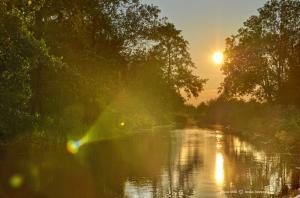 No better way to end this day than making a little boat trip through the network of canals. After watching the impressive parade of tall ships at Sail Amsterdam, we went to take a look at Zaanse Schans. This neighbourhood of the city of Zaandam has a lot of wonderfully preserved windmills and tradional houses. 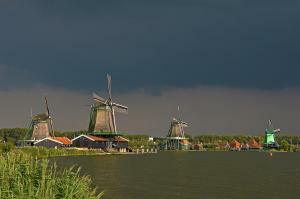 The weather provided some dramatic lighting effects: while dark skies were getting closer, the windmills on the banks of the river Zaan were still illuminated by the sun. By the time the clouds dropped their loads, we were safe under a parasol at a nearby cafe. 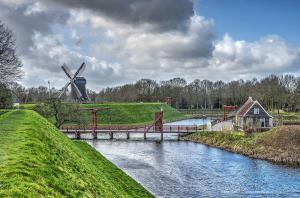 For more images of Zaanse Schans, visit my profile. There's a new product in my shop...and in all the other shops at Fine Art America: shower curtains! They're made from 100% polyester fabric and include 12 holes at the top of the curtain for simple hanging from your own shower curtain rings.Images are printed on the outside surface (outside of the bathtub), and the inside surface is solid white. 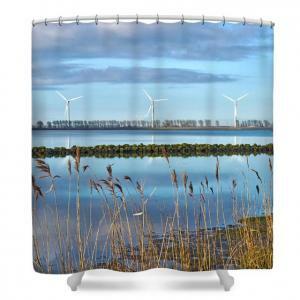 Still I am convinced that many of my images will look good on a shower curtain. And please note that they can be scaled and dragged to get the perfect fit. Probably images with a water theme, which are quite present in my lowlands collection, are best suited for use in the bathroom. Like the one shown here: Windmills on a Windless Morning. I know the nickname Venice of the North has been given to many places, but when I'm walking around in Dordrecht it seems very appropriate.The town is located spectacularly at a junction of four rivers and traversed by a number of canals. On many places houses and other buildings are built directly next to the water. 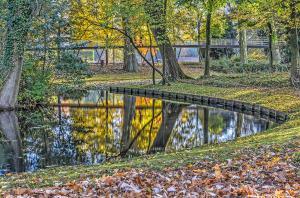 There are many bridges, quays and jetties that provide beautifull and surprising views of this watertown. 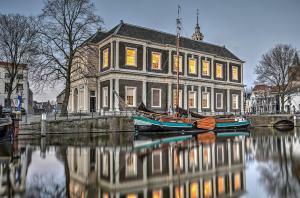 Also, the fact that "Dordt" is not as well-known as some other Dutch watercities, is a blessing in disguise, since it certailnly helped to preserve the town's charm and authenticity.